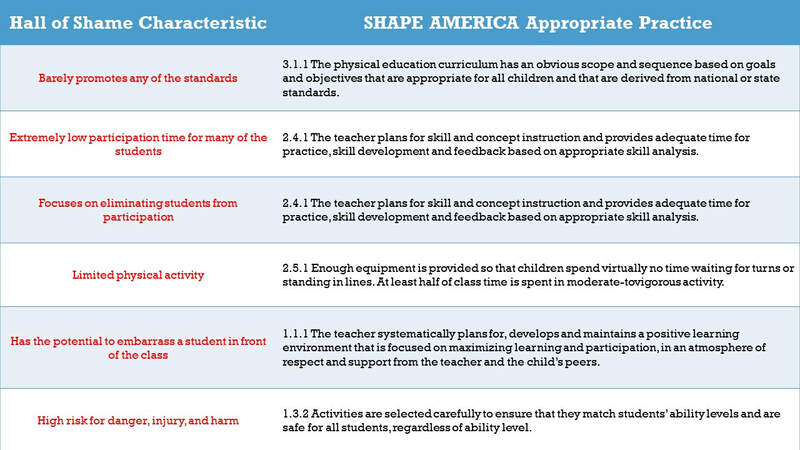 3.1.1 The physical education curriculum has an obvious scope and sequence, based on goals and objectives that are appropriate for all students and that are derived from national or state standards. 3.1.2 The physical educator includes motor skill development, physiological and biomechanical concepts, health-enhancing physical activities that lead to a physically active lifestyle, and opportunities to develop appropriate social behaviors. 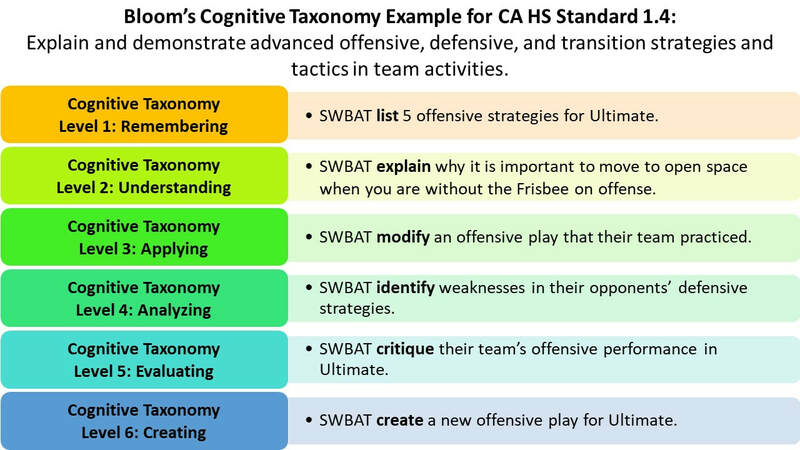 3.1.3 Instruction follows a scope and sequence that is designed to scaffold prior learning and develop mature forms of skills and strategies. 3.1.4 Teachers design progressions that allow students to build on previously learned content and skills, by focusing on lifetime activities. ​Content should also be revisited throughout the year. 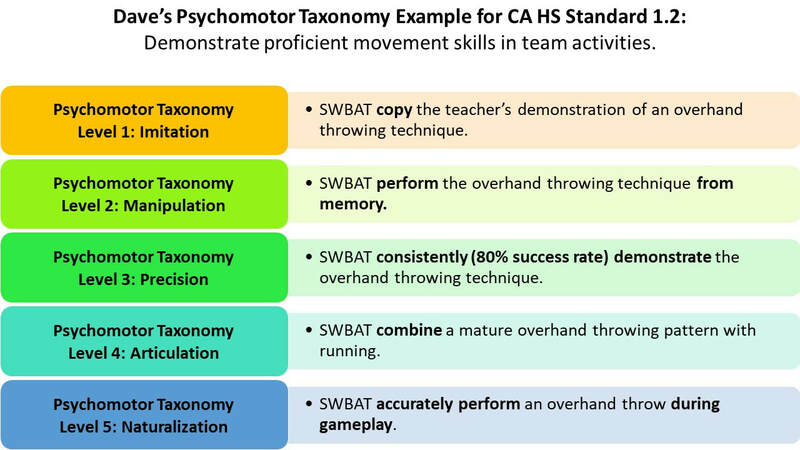 ​Standards are often comprehensive and include multiple Student Learning Objectives. 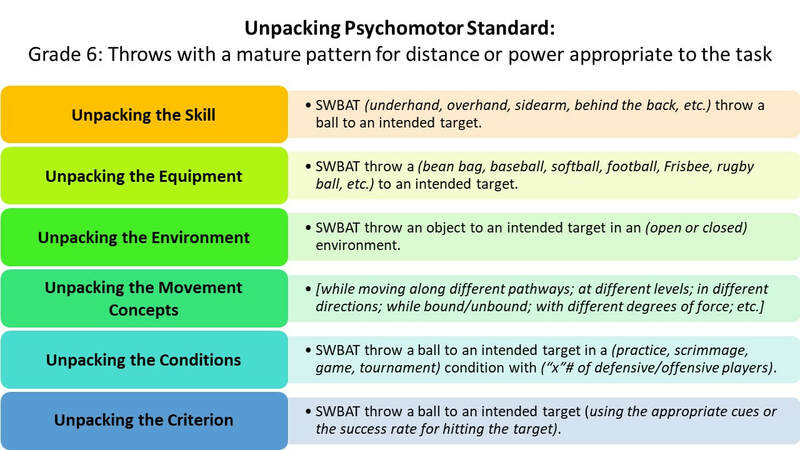 After reading each Standard, ask yourself “What do my students need to know and be able to do to meet this Standard?” The table below shows how many SLOs can be created from one Psychomotor Standard. 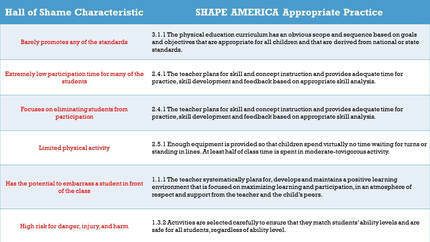 Find more information on unpacking standards from The Physical Educator. 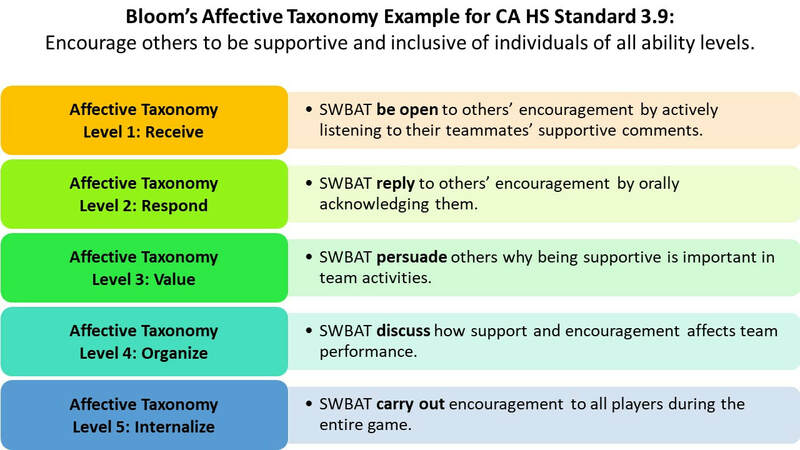 Below are examples of student learning objectives (SLOs) for each domain of learning. For more information see our ​Domains of Learning and Writing Learning Objectives page. Key Questions from Instructional Models for Physical Education, 3e (Exhibit 6.7, p. 147), by Michael W. Metzler. Copyright ©2011 by Holcomb Hathaway. Below is a video on how to create standards based lessons from Terri Drain. Also see this video for an example of a standards based lesson. Requires little training or pedagogical skill to teach - Complexity of a task does not relate to its quality. Overemphasis on and concern for fun - A standards based program negates this issue​. Does not address the proposed student learning objectives - A standards based program negates this issue​. Lack of emphasis on teaching motor skills and lifetime physical activity skills - A standards based program negates this issue​.